Would you expect to see kilts on motorcycles? To be honest I wouldn't have, that is until one of the visitors to the site wrote to me using the simple form on the "Contact Us" page. His name is Pedro, and he rides a motorcycle, nothing unusual in that you might think, many people ride motorcycles. But Pedro rides his while wearing his kilt, below you can see one of the photos he sent me, and very kindly gave his permission for them to be featured on this page. His email was the inspiration for this page, as it got me wondering how many other motorcyclists out there wear their kilts while riding their motorcycles? 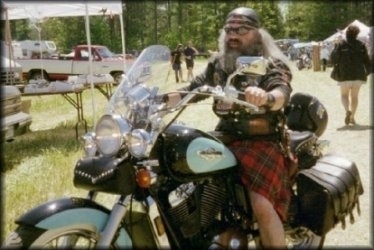 Now you may think kilts on motorcycles are somewhat dangerous, and I'm not talking about a sudden gust of wind. I mean of course what happens if you are unlucky enough to come off your motorcycle, would your kilt provide you with adequate protection in an accident? Probably not, but then neither would a pair of shorts and you see plenty of motorcyclists wearing them in warm weather. Now please don't misunderstand me, I'm not advocating riding your motorcycle without taking proper care as regards your safety. So why would anybody want to wear their kilt while riding their motorcycle? Well never having ridden a motorcycle I can't answer that question with any degree of certainty, but judging from the photos it certainly looks like fun. And I can think of no better way of keeping a cool circulation of air going, on a hot summers day, than wearing your kilt while riding your motorcycle. I would also imagine you would definitely be noticed, and stand out from the crowd. Now there is on thing you can't do on a motorcycle, even if you are wearing a kilt, and that is take a nap. So Pedro had to swap his motorcycle for a bench during Daytona Bike Week, when he felt the need to take forty winks, as you can see from the photo below. 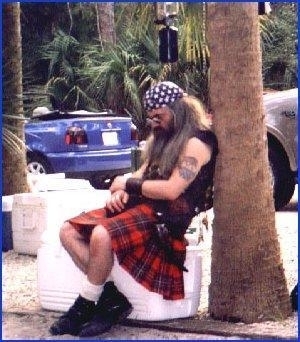 And as well as having more than one motorcycle, he clearly has more than one kilt as the next photo shows. So there you have a glimpse of one Scottish/Irish man, now living in America who loves to wear his kilt while riding his motorcycle. Incidentally when he's not doing that he is carving leather, yes he is a Celtic leather craftsman. Do you also wear your kilt while riding your motorcycle? and if so would you like to have your photo featured on this page? 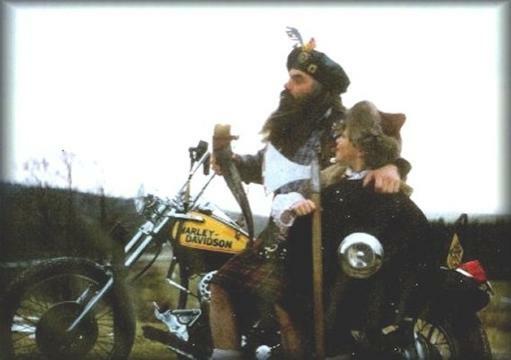 If the answer to that question is yes, then please contact me using the simple form on the "Contact Us" page, which you will find near the bottom of the navigation bar, I would love to show your kilts on motorcycles photos to the world.